The Hynñiewtrep Youth Council (HYC) on Friday demanded from the Home Minister, James K. Sangma to deploy police personnel and intervene into the alleged coerces of the Assam police in areas under Block II in Ri-Bhoi district bordering West Karbi Anglong district. A delegation of HYC met the Home Minister in the secretariat here on Friday and apprised about the recent incident in the area. The HYC said that an SSA-funded school building, a community hall and two IAY houses were dismantled by the Assam police at Khliehumwang and Umru villages. HYC general secretary Roy Kupar Synrem said that the Council demanded from the government to immediately deploy security personnel and ensure security of the villagers along the inter-state border. Synrem said that an existing police out-post at Mawlasnai did not have the required manpower and could not provide adequate security to the villagers. He said that the Home Minister has assured that he would call a meeting with the Director General of Police (DGP) to take stock of the situation. 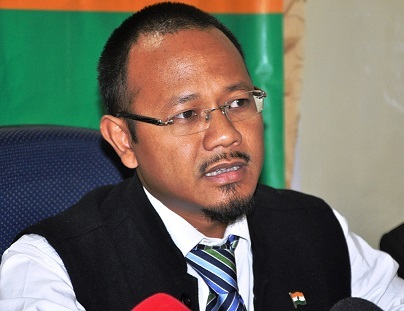 Quoting the Home Minister, Synrem said that the state government has been honouring the status quo that both Meghalaya and Assam should maintain especially in disputed areas, and the state government would take up the matter in the upcoming meeting of the two Chief Secretaries of the two states. Interestingly, the HYC said that when its delegation from Ri-Bhoi district met Deputy Commissioner of Ri Bhoi district, R.M Kurbah at Nongpohon Thursday, the DC took up the matter with the DC of West Karbi-Anglong, but the DC of West Karbi-Anglong claimed that the district administration has no knowledge about the incident at Khliehumwang and Umru. “We told the Home Minister that if the Assam authorities denied the involvement of Assam police in dismantling the infrastructure, Meghalaya should put pressure on Assam to take stern action against non-state actors,” Synrem added.